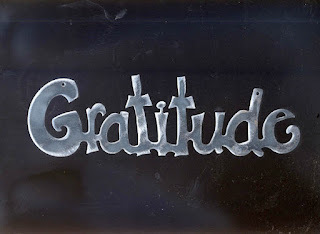 I've heard this phrase, "the attitude of gratitude" for years now. It's a pretty simple concept, but can be a tough one to master -- as it is with most "simple truths." As November draws to a close, I once again realize that I have much to be grateful for in my life. Surprisingly, I did not partake in the "30 Days of Thankfulness Fest" on Facebook. I'm not sure why. I'm definitely all about being thankful and letting people know what I'm thankful for, but I think some part of me didn't want the pressure of having to think of something and then post it. Maybe I just wanted it to be a bit more organic and natural. Or...I could have just been commitment-phobic. That is probably a little true too.